Description: The Gigantes group of islands in Carles, Iloilo are endowed with limestone forests, caves, and white-sand beaches. It is classified as a high urgent conservation priority under the Philippine Biodiversity Conservation Priority-Setting Program (PBCPP) It is home to a wide variety of species, 2 of them endemic: the Gekkonid Lizard (Gekko gigante) and the Island Forest Frog (Platymantis insulatus). The 44,249-hectare site is marred with political, economic, and cultural issues, which result in resource degradation, insecurity, and vulnerability of the island and its communities. The islands are located within the Visayan Sea, one of the most productive fishing grounds in the country. As part of the Coral Triangle, these islands contain some of the most biologically diverse and richest coastal and marine resources. Gigantes Islands are known for their bivalve (scallop/clam) and squid fisheries. Gigantes Islands is one of the 6 conservation priority sites of FPE. At the height of Typhoon Yolanda (2013), in addition to devastation of infrastructure and livelihood, it was reported that caves, where endemic species of geckos and frogs thrive, were used as refuges / evacuation sites. Several caves have high levels of disturbance from human activity (treasure hunting, collection of speleothems, high human foot traffic, graffiti / vandalism, litter, and mining for guano). Despite this, the status of Platymantis insulatus and Gekko gigante are secured, according to a cave assessment completed in 2014. A long term ecological program to monitor the population of the two species (both those inside the caves and those that inhabit forests over limestone karst) is highly recommended. The islands are marred with widespread poverty (poverty incidence rate is 80%). There is a need for greater community representation and participation in the barangay development councils.. The prevalence of destructive activities and the entry of commercial fishing exact heavy toll on fisheries resources. Unregulated toursism activities are placing the carrying capacity of tourist sites at risk. Policies are available but enforcement remains problematic. Local government units adopted a strategic action plan (2012-2016), focusing on five strategies: sustainable fisheries, livelihood, healthy community, biodiversity conservation, and ecotourism. Disaster risk reduction management (DRRM) will also be given attention. The Island Sustainable Development Alliance (ISDA) for Gigantes intends to coordinate the conservation strategies and initiatives in the island. Poverty has driven local development to become heavily reliant on natural resources. Vast forest denudation due to charcoal making and slash and burn farming. The remaining scrub vegetation is stunted. This has changed climatic conditions in the island, and exposes teh topsoil to erosion during monsoon season. In-migration and unmanaged tourist activities put the delicate balance of cave and karst ecosystems at risk. Pollution from settlements and conversion of land and marine territory have negatively tipped the island's biodiversity status. The need to rehabilitate the ecosystems is all the more pressing. The link between the state of the ecosystem and the impact of disasters must be clearly established. Effective management of ecosystems that produce healthy forests, mangroves and coral reefs can reduce physical exposure to hazards and increase both ecosystem and community resilience. An integrated conservation management framework must be pursued and safeguarded, in consultation with experts and local partners. The project builds on the gains of the ongoing engagements in Gigantes, and focuses on addressing the gaps in the 5-year Strategic Plan (2012-2016), facilitate formulation of the 10-year conservation management plan, enhance community organizations to develop functional protection mechanisms, and develop informed communities as active partners towards island resilience and sustainable use of the island ecosystem. 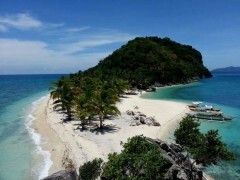 A Sustainable Tourism Plan, as part of the 10-year Gigantes Islands Conservation Plan, has already been conceptualized. The Technical Working Group will convene on March 1, 2017 to work on the draft. Avicennia sp. (local name: miyapi) was planted by the community, with the guidance of the Zoological Society of London (ZSL) – Philippines, in a 2-hectare area of Barangay Gabi in Gigantes Sur. The community was also trained by ZSL on the correct protocols of mangrove planting. Capacity building activities on organizational development & leadership for ISDA was conducted. Further training activities are in process. Twenty-six (26) environmental youth champions were identified and were sent to Danjugan Marine Camp (an FPE partner) for further training on marine conservation. The identified tourism policemen awaits formal deputation, they were however, been deputized as Bantay Dagat. The project facilitated Convergence and ISDA meetings in the Municipality of Carles and in Gigantes on August 2016, which resulted to a planning workshop on Ecotourism. Conservation corners in identified schools were established, but it needs more information materials for students’ reference and use. An Island Way of Life: Resource Assessment and Strategic Plan Development for Gigantes Islands, Carles, Iloilo, 2013. Kalikasan BCSD Knowledge Series 15. Foundation for the Philippine Environment and Iloilo Caucus of Development NGOs (ICODE).